Interest on money causes financial instability and contributes to economic cycles. Governments and central banks try to reduce financial instability and economic cycles. Because of their measures, many people think that they are safe. This introduces a moral hazard because the measures of governments and central banks enable financial institutions to take more risks. Ultimately, this moral hazard weakens the financial system and undermines the value of money. All this happens at the expense of the real economy. Banning interest on money causes problems because interest on money also reflects the return on capital. Nevertheless, it is possible to have negative nominal interest rates that do not exceed zero if the value of money can rise. This provides a real return on money that reflects the return on capital. Banking without positive nominal interest rates can lead to a more efficient economy because interest does not contribute to economic crises any more. The increased efficiency ensures that there will be a financial system without interest in the future. The website www.naturalmoney.org is dedicated to this issue. It has been nearly five years ago since I first published an article about the theory of Natural Money. In short the theory states that money with a holding fee combined with a ban on charging interest could, under specific circumstances, produce a more efficient economy. If this is correct then the implications are far-reaching. Natural Money may become the predominant type of money in the future, simply because it is more efficient. Efficiency is not a matter of desire or preference. Practically nobody wanted capitalism at first, but it emerged as the dominant economic system because it was more efficient. The same may apply to Natural Money. Five years ago I only had a vague idea about the origin of the superior efficiency of Natural Money, but over time the idea has been developed further into an economic theory that is a good starting point for more research. This report explains where the theory of Natural Money currently stands. The introduction section explains Natural Money in plain terms and gives a few examples from history. Five years ago this was the starting point of my investigations. After the introduction section, the economic theory of Natural Money is explained. This requires considerable economic knowledge. For people who are not interested in the field of finance, it will become boring from that point on. Compound interest is infinite in the long run. Assume that a 1/10 oz gold coin was put in the bank on interest in the year 1 AD on 4% interest. How much gold would there be in the account by the year 2000? The answer is: 3.6 * 10^31 kilogramme of gold weighing 6,000,000 times the complete mass of the Earth. Compound interest must be paid from debts so they tend to grow until interest payments cannot be met. This is a financial crisis and this often precedes an economic crisis. Natural Money is money with a holding fee and a ban on charging interest. By putting money in a savings account, savers are rewarded with not having to pay the holding fee. As interest is a reward for risk, a ban on charging interest will curb risk taking in the financial system and those risks will be taken by investors. The absence of interest on money mitigates economic cycles, which further reduces the risks of banking. In such a situation government and central bank support are not needed. 1. It is not allowed to charge interest on Natural Money. 2. There is a tax on holding Natural Money. This is not a tax on wealth, so shares, real estate and money lent, are not subject to this tax. 3. Banks and governments are not allowed to create Natural Money so inflation will stop. 4. The holding fee on Natural Money is an incentive to use the money for investment, consumption or lending without interest. - Money will only be lent to reliable people and companies. - Less money will be lent and more money will be directly invested in equities and real estate. 6. There will be fewer economic crises as Natural Money will be spent or invested directly and there will be fewer debts. 7. There are fewer economic crises so the economy grows more steadily. 8. As the economy grows steadily, while no additional Natural Money is created, prices will fall. 9. There will be sufficient business activity and work so we can live without fear for economic crises. 10. Improved economic growth causes zero percent Natural Money loans to have real returns that are better than returns in the interest based financial system. 11. If Natural Money is applied somewhere, it will cause a capital flight to the interest free economy because of the higher returns. 12. This will force the rest of the world to adopt Natural Money. The holding fee combined with the restrictions on credit appear to make Natural Money efficient. There is a constant stimulus that is sustainable because it is not caused by the expansion of debt. More efficient systems will replace less efficient systems in competition so Natural Money may become the dominant type of money in the future. It seems too good to be true. But is it? On July 5, 1932, in the middle of the Great Depression, the Austrian town of Wörgl introduced a complementary currency. Wörgl was in trouble and was prepared to try anything. Of its population of 4,500, a total of 1,500 people were without a job and 200 families were penniless. The mayor Michael Unterguggenberger had a long list of projects he wanted to accomplish, but there was hardly any money to carry them out. These projects included paving roads, streetlights, extending water distribution across the whole town, and planting trees along the streets. Rather than spending the 40,000 Austrian schillings in the town’s coffers to start these projects off, he deposited them in a local savings bank as a guarantee to back the issue of a type of complimentary currency known as stamp scrip. The Wörgl money required a monthly stamp to be stuck on all the circulating notes for them to remain valid, amounting to 1% of the each note’s value. The money raised was used to run a soup kitchen that fed 220 families. Nobody wanted to pay the monthly stamps so everyone receiving the notes would spend them as fast as possible. The 40,000 schilling deposit allowed anyone to exchange scrip for 98 per cent of its value in schillings but this offer was rarely taken up. Of all the businesses in town, only the railway station and the post office refused to accept the local money. Over the 13-month period the project ran, the council not only carried out all the intended works projects, but also built new houses, a reservoir, a ski jump and a bridge. The key to its success was the fast circulation of the scrip money within the local economy, 14 times higher than the Schilling. This in turn increased trade, creating extra employment. At the time of the project, unemployment in Wörgl dropped while it rose in the rest of Austria. Six neighbouring villages copied the system successfully. The French Prime Minister, Édouard Daladier, made a special visit to see the 'miracle of Wörgl'. In January 1933, the project was replicated in the neighbouring city of Kitzbühel, and in June 1933, Unterguggenberger addressed a meeting with representatives from 170 different towns and villages. Two hundred Austrian townships were interested in adopting the idea. At this point the central bank panicked and decided to assert its monopoly rights by banning complementary currencies . The Bible contains a story about the Pharaoh having dreams that he could not explain. The Pharaoh dreamt about seven fat cows being eaten by seven lean cows and seven full ears of grain being devoured by seven thin and blasted ears of grain. Joseph was able to explain those dreams to the Pharaoh. He told the Pharaoh that seven good years would come and after that seven bad years would follow. Joseph advised the Egyptians to store grain on a large scale. They followed his advice and built storehouses for grain. In this way Egypt survived the seven years of scarcity. What is less known, because it is not recorded in the Bible, is that the storage of grain resulted in a financial system. The historian Friedrich Preisigke discovered that the Egyptians used grain receipts for money and had built a sophisticated banking system based on this money . Farmers bringing in the food received receipts for grain. Bakers who wanted to make bread, brought in the receipts which could be exchanged for grain. According to the Bible, Joseph took all the money from the Egyptians. This may have prompted them to invent an alternative currency. It may not have taken long before the grain receipts were accepted as money. The degradation of the grain and mice eating from it, caused the value of the receipts to decrease steadily over time. This stimulated people to spend the money. The grain receipt system lasted for many centuries. It made sense to store food to provide for hard times. The actions of Joseph may have created this system as he allegedly proposed the grain storage and took all the money from the Egyptians. When Joseph came to Egypt, the country had already passed its zenith and the time of the building of the great pyramids was centuries earlier. A few centuries later, during the reign of Ramesses the Great, Egypt became again a leading power . Some historians suggested that the wealth of Egypt during the reign of Ramesses the Great was built upon the grain financial system . The grain money remained in function in Egypt after the introduction of coined money around 400 BC until it was finally replaced by the Roman currency. The money and banking system were stable and survived for more than a thousand years without collapsing, possibly because the storage fee made people more willing to lend out money without charging interest. It seems therefore possible to have a sophisticated banking system with Natural Money. So why does this supposedly efficient money with a holding fee not dominate the world already? Similar experiments like the one in Wörgl did not produce similar results. The success of the Wörgl currency has been inflated by the payment of taxes in arrears that could be spent by the town council . Maybe it is too good to be true after all, but the theory suggests that it isn't. Making the idea work in practise is a major challenge. Many assumptions behind community currencies and interest-free money conflict with accepted economic theories on interest. This may explain their limited success. It also seems that the currency must be legal tender in order to make it work. If interest free money is more efficient then it must be provable and it must be possible to discover the preconditions that need to be satisfied for interest free money to become a success. If the proof is there and the preconditions are uncovered then it may still be a long way to the moment that the idea is first put into practise, unless an economic crisis occurs. This could happen any time because interest on money is unsustainable in the long run. During a crisis people may be willing to try out new ideas. Out of the experiments, the most efficient system may emerge. Most likely this will be Natural Money. The unsustainability of interest on money and the effects of demurrage are both not mainstream economics. There is little thought on the consequences of interest on money for risk taking in the financial system and the effects of interest on the stability of the financial system, which are both core issues in the theory of Natural Money. As a consequence there is some ground breaking theory making in the economic model of Natural Money and there is not much reference material to back it up. A common mistake is that a ban on interest is a ban on business profits. Within the theory of Natural Money capital deserves a reward to be employed. Another mistake is that credit is not available with Natural Money. It is likely that credit will be restrained and that debts cannot grow out of control, but there will be credit with Natural Money. It may also be difficult to understand that Natural Money can emerge as the dominant type of money because a ban on charging interest on money may cause interest rates to be higher in real terms. The paper intends to explain how an economy based on Natural Money will operate. To this aim economic models are made using regular economic theories. It is assumed that the reader of this document has basic economic knowledge. Economic thought is an important development as it is about making the best out of limited resources. Without organisation and trade it would not be possible to have the standard of living we have nowadays. On the other hand, economic thinking is about to create a disaster of unprecedented proportions. The growth of economic activities will hit the limits of our planet in the foreseeable future. Self-interest is the basic driver for economic development. The pursuit of self-interest does not always lead to desirable outcomes but government interventions in the economy tend to make problems worse. The political debate now focuses on economic freedom versus government regulation and intervention, but ancient economic thought has produced at least one great achievement that may help to reduce this tension, which is identifying the problematic nature of interest on money. With Natural Money it may be possible to achieve most of the goals aimed at by government intervention without the need for government intervention as the economy may be able to achieve the desired policy objectives on its own. Many economists assume that government interventions make the economy less efficient so Natural Money may enhance the efficiency of the economy. The document explains the merits and limitations of different influential schools of economic thought, such as classical economics, Keynesian economics, monetarism, rational expectations and supply side economics. Some other schools of thought are also explained, such as the Austrian School, the community currencies movement, Socialism and steady state economics. Those approaches have all contributed to the theory of Natural Money. Finally an outline is given of the expected effects of Natural Money on the economy. Natural Money may help to produce a more efficient market economy. The research continues. Instead of continuing to read this document, it is possible to read the research as it currently is in The Natural Economy. The lure of having more money in the future is at the basis of lending out money at interest. Because the amount of money is limited, it will become increasingly difficult to repay debts with interest, unless savers spend their money or new debts are made. Insofar those debts can be exchanged for money, which is the case with bonds and savings as they represent claims on debts, their creation tends to be inflationary. From time to time interest payments cannot be met because there is a limited amount of money in circulation. At that moment the scheme collapses and a bust cycle sets in. Insofar those debts could be exchanged for money, their destruction tends to be deflationary. During a boom phase interest rates rise. Promises are made that cannot be kept because the pool of money is limited. Borrowing against demand deposits or fractional reserve banking has made it possible to issue loans without the need for savings. In this way interest rates are suppressed when investments exceed savings during the boom phase. This fuels the boom as higher interest rates would have curbed the boom sooner. Because interest rates cannot go negative, they are propped up when savings exceed investments during the bust phase. This extends the bust phase because lower interest rates would have ended the bust sooner. If banks can only lend against savings and nominal interest rates can be negative then an active management of money supply, interest rates and aggregate demand by governments and central banks may not be needed. It is likely that in mature economies of stable societies with political freedom and respect for property rights, the natural rate of interest set by the market that matches savings and investments and guides the economy on the maximum sustainable growth path without booms and busts, is in nominal terms at or below the rate of money supply increase. This can still be a positive real rate when there is economic growth. To deal with the boom bust cycle and to deal with bank runs that come from the charging of interest on money, central banks, government guarantees as well as monetary and fiscal policies have been introduced to manage interest rates, money supply and aggregate demand. Those instruments have turned out to be awkward because the best course of action is difficult to know in advance, but also because policy actions distort markets and favour politically connected people and businesses. Economists often assume that there is a neutral rate of interest that can guide the economy on the maximum sustainable growth path without booms and busts. The neutral rate of interest may differ from the natural rate of interest set by the market so economists often assume that it must be set by monetary policies. The monetary policies appear to be needed because there is a boom-bust cycle caused by interest on money, amplified by fractional reserve banking. During a boom phase the neutral rate of interest is above the natural rate of interest because economic growth is above the maximum sustainable growth path, while during a bust phase it is below the natural rate of interest because economic growth is below the maximum sustainable growth path. Monetary policies tend to be too easy during the boom phase as it is difficult to determine the neutral rate of interest. High interest rates will also prompt a bust and policy makers prefer not to be responsible for creating busts. As a consequence policy makers tend to extend booms and mitigate busts, so overall monetary policies tend to be too easy and money supply as well as debts continue to grow. Mostly money supply growth exceeds nominal interest rates because the scheme of compound interest cannot be sustained. The continued debt expansion makes interest payments continue to grow, even at lower interest rates. This prompts the need for new debts and money printing that undermines the value of the currency. The basis of civilisation is specialisation and the division of tasks. Money is the agent that makes this possible. If money becomes worthless then a society can disintegrate. The escalating moral hazard within the financial system may in the end destroy currencies, and may bring down nations and civilisations with it. It is the ultimate consequence of charging interest on money and trying to work around the perverse consequences of interest using government and central bank interventions. Monetary and fiscal policies have created a false sense of security and this entailed a moral hazard. It enabled market participants to increase their leverage. The policy instruments do not deal with the underlying issues that create financial instability, which are interest on money and fractional reserve banking. Risks tend to be extended until the point of breaking because there is an incentive to do so in the form of interest. The instruments of policy makers turned out to have done the opposite of what they intended to do. They increased the overall level of risk and offloaded this risk to the public. Our current monetary system does not allow for negative nominal interest rates. There is no holding fee on money, so there is no incentive to lend out money at extremely low, zero or negative nominal interest rates. Interest on money is an allowance for the risk of default and also reflects the rate of return on capital. Higher interest rates increase the risk of default when the amount of real money (M1) is fixed. With respect to risk, interest on money is a lose-lose proposition. When interest rates could be negative in nominal terms then it is possible to reduce this problem. For this, a holding fee or demurrage on money is needed. Natural Money is a currency with a holding fee and a ban on charging interest. By putting money in a savings account savers accept the risks attached to banking and are rewarded with not having to pay the holding fee. As interest is a reward for risk, a ban on charging interest will curb risk taking in the financial system. Risks will be offloaded to investors so banks will be relatively safe. Savers will also keep a close eye on their bank, making the bank less willing to engage in risky activities. The absence of interest on money mitigates economic cycles, which further reduces the risks of banking. In such a situation government guarantees and central bank support may not be needed, which eliminates the moral hazard. - On the money in circulation a holding fee or demurrage is levied by the issuing government. - The amount of real money (M1) is fixed and it can only be changed after a referendum. - If the amount of real money (M1) is altered, the nominal value of savings and loans should be altered with the same percentage. - Governments must always maintain a balanced budget and there is no government debt. - A bank can only provide banking services and cannot invest directly in other types of businesses. - No holding fee needs to be paid on money in a savings account. - Loans must be made out of savings and only savings are subject to the risk of bank failure. - Money in current accounts is not part of bank capital. It is not available for lending nor is it subject to the risk of bank failure. - Banks must keep a reserve against savings that can be withdrawn on short notice. Government debts will be problematic with Natural Money so government deficits should not be allowed. With Natural Money, government deficits will crowd out private investment spending. There is a limited pool of savings because there is a maximum interest rate. With Natural Money, there is no reason for governments to go into debt. There is no need for deficit spending to provide an economic stimulus. Furthermore, if government spending needs to be increased, taxes could be raised. Whether or not fractional reserve banking should be allowed is of lesser importance than the acceptance of the risks of banking by savers. As banks have a maturity transformation function it is difficult to make a clear distinction between fractional reserve banking and making loans out of savings. It may be possible to have savings accounts with deposits available for immediate withdrawal. In the Natural Money arrangement it is only possible to use money in current accounts for payment. Money in savings accounts has to be withdrawn and deposited into a current account before it can be used for payment. - a usurious rate of interest, which is a positive interest rate on money relative to the change in the amount of real money (M1). A usurious interest rate contributes to financial instability. If the nominal interest rate equals the change in the amount of real money (M1) then there is no usury. In that case the real rate of interest tends to be near the rate of economic growth, provided that the velocity of money remains constant. If the amount of real money (M1) is constant as is the case with Natural Money, then the nominal interest rate should not exceed zero in order not to become usurious. Nevertheless Natural Money will encourage saving because the demurrage can be evaded on a savings account. A combination of mechanisms will curb the increase of money substitutes (M2). First, banks must keep a reserve against savings that can be withdrawn immediately, so a growth in savings will reduce the amount of money in circulation (M1). Second, loans must be made out of savings so for every borrowing there must be a sacrifice in the form of saving. When the expansion of M2 produces price inflation there will be an increased reluctance to lend funds at a maximum rate of zero percent and there will be less funds available for borrowing. During a potential economic boom more funds will be invested directly in promising projects and the funds available for borrowing will reduce, so a potential economic boom will not be fuelled by lending and borrowing. With Natural Money banks can lend money at a maximum interest rate of zero percent. For this banks can charge an intermediary fee to savers so savings have negative interest rates. For long term deposits those rates tend to be close to zero. Interest rates near zero percent with Natural Money may be more attractive to savers than interest rates in the current financial system because they may be higher in real terms or they may offer a better risk/reward ratio. For example, if the money supply growth in the current financial system is seven percent and the long term interest rate is three percent then the Natural Money interest rate of zero percent may be four percent higher in real terms assuming that economic growth is the same. Financial instability caused by positive nominal interest rates and fractional reserve banking as well as policy actions to deal with financial instability have been a boon to informed people in the financial sector. They operate at the expense of the real economy. Reducing financial instability and trading in the financial system to a certain extent may improve economic efficiency. Financial activities have become a plague in recent decades because of financial innovations that exploit the instabilities caused by interest and fractional reserve banking as well as the policy actions to counter them. An economy operating under the regime of Natural Money may be more efficient as it may be on the maximum sustainable growth path most of the time while less productivity is lost on unproductive financial activities and government interventions. This may attract capital at the expense of economies allowing usurious rates of interest and managed economies that try to avoid usurious interest rates by fiscal and monetary policies. With Natural Money real returns could be higher if the natural rate of interest keeps the economy on the maximum sustainable growth path. In the future all monetary systems may therefore be based on Natural Money. Natural Money currencies can be issued on the international, national, regional as well as the local level. With Natural Money it may be possible to support national as well as regional and local economies and to decentralise economic decision making. Regional and local currencies introduce exchange costs and will make it profitable to localise production when the benefits of the economies of scale are smaller than the currency exchange costs. In such a situation local and regional currencies may reduce external competition, giving regions and communities the opportunity to become more self-dependent. Increased currency exchange costs may cause higher interest rates and this could become an impediment to more regional and local self determination. Government bureaucracies have a tendency to expand and waste resources as maximising profit is not a motive in government bureaucracies. The problem of bureaucracy is the belief that a government can solve many perceived problems, relieving citizens from their responsibility to deal with them. Citizens are not likely to counter this trend because the cost of a central government is spread over a large number of people. Delegating government responsibilities to the regional and local level may give people a greater incentive to strike a better balance between government action and citizen engagement as the cost of government can be more directly influenced by citizens. For example, if benefits are paid for a significant part from local taxes then local employers may work together to hire difficult to employ people as a reduction in local taxes benefits those employers more directly. People may feel more pressure to find a job as their benefits are paid for by their community. Regional and local currencies can make an economy more efficient despite the increased currency transaction costs because it can reduce the overall cost of government and enable marginally competitive people to find employment at reasonable wages without the need for government intervention. To offset arbitrariness, a central government may need to apply guidelines for the operation of regional and local governments as well as regional and local currencies. Natural Money currencies are not attractive as currency reserves because of the holding fee. Exporting nations will dispose of received currency balances by matching exports with imports. As a consequence comparative cost advantages will become the predominant driver of international trade. Trade probably is more beneficial if it is based on comparative cost advantages. This requirement may restrict trade because of currency risk, but it also prevents the emergence of trade imbalances as currency values will adapt more quickly to a changing economic reality. Currency risk may cause higher interest rates and this could become a problem as Natural Money has a maximum interest rate. In the past tariffs have been used to protect national industries. There is no magic formula for determining what tariffs on what products are needed or justified so decisions on tariffs have often been arbitrary and political. If fact, tariffs caused uncompetitive industries to be subsidised by competitive industries. Currency transaction costs do not have this disadvantage as they are indiscriminate. This may lead to somewhat higher prices for consumers because of reduced competition. On the other hand communities and nations may be able to achieve more self-sufficiency. Most people identify money as coins and bank notes but current accounts are also money. Economists identify different types of money. The most important ones are medium of exchange (M1) and store of value (M2). M1 includes coins, banknotes and current accounts in the hands of the public. M2 includes M1 as well as savings accounts and time deposits . In economic language M1 is real money while M2 also includes close substitutes for money such as savings. When money is put into a savings account, M1 decreases but M2 remains constant. If a loan is made, M1 increases and M2 also increases because M1 is part of M2. For example, when Mark puts money in a savings account, he exchanges his money for a claim to receive money from the bank. For this he receives interest. The action of Mark decreases M1 but not M2. The bank can use this money to make a loan. For example, when Elise borrows the money from the bank and spends it, money is put back into circulation. In exchange for the money, Elise has now a debt to the bank on which she must pay interest. Because of the loan M1, M2 and debt increase with the same amount. Any increase in M2 is backed with an increase in debt. When Elise pays back the loan, M1, M2 and debt decrease with the amount of the loan. When Mark exchanges his savings for money, M1 increases but M2 does not change. When Mark puts money in a savings account and Elise takes out a loan, the amount of close substitutes for money in circulation (M2) increases, but the amount of money (M1) does not increase. If banks can only borrow against savings, Elise cannot borrow more than Mark has saved. With fractional reserve banking banks do not need savings to make loans. They can make loans if there is money in current accounts. Fractional reserve banking enables banks to inflate the amount of real money (M1), which tends to result in price inflation. Liquid markets have blurred the distinction between money, money substitutes such as savings and liquid assets such as stocks. Money can often be withdrawn from savings accounts instantly at no cost and interest rates between savings accounts and current accounts do not differ much. The financialisation of assets has eroded the importance of traditional measures for money such as M1 and M2. Stocks and bonds can be sold instantly at little cost so there is little difference between money, stocks and bonds from a liquidity perspective. Increases in M1 and M2 are monetary inflation while decreases in M1 and M2 are monetary deflation. There is a link between the amount of money and close substitutes in circulation and prices in the equation Money Stock (M) * Velocity (V) = Price (P) * Quantity (Q) where money stock (M) equals M1 + M2. Prices are not only determined by the money stock (M) but are also affected by quantity (Q) and velocity (V). 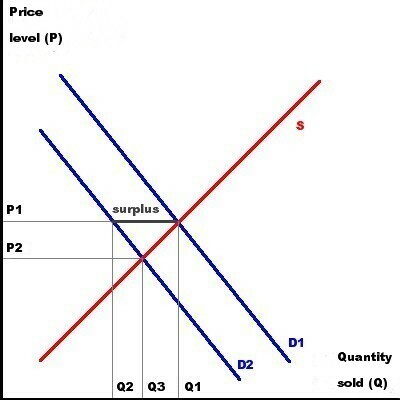 The quantity (Q) is economic production so economic growth tends to reduce the price level. The velocity of M2 (Vm2) is lower than the velocity of M1 (Vm1) so a change in M2 does not have the same effect on the price level as a change in M1. The price level (P) is often computed using a price index . The price index has some subjective elements affecting quantity (Q) such as the weighing of goods and services in the index and quality adjustments. For example, if computers make up 4% of expenses and computing power doubles every two years while the price remains the same and this is fully accounted for as a quality improvement, this could reduce the inflation figure with nearly 1% because the capabilities of computers increase with 22.5% every year. It is questionable whether or not the utility value of computers has risen with the same amount. Policy makers like low inflation figures so price indexes should be regarded with caution. 3. time preference because having money now represents more freedom than receiving it in the future. In a competitive free market interest rates on money tend to reflect the productivity of capital. If they did not, and the risk/reward ratio of capital was better or worse, interest rates would adjust until they do reflect the productivity of capital . For example, if interest rates are low and the return on capital is high, more people would be willing to invest in capital directly. Interest rates also reflect the expected rate of inflation and the risks associated with the borrower. Default and inflation are both risks associated with lending out money. A time preference for money exists because it represents undifferentiated spending power. If you have money now then you can choose to buy something today or keep the money and buy something some day in the future. If you receive the money in the future, you do not have the freedom to spend it now. This contributes to positive nominal interest rates. Money does not depreciate like capital and this is a systemic inefficiency that contributes to interest on money. Nobody will accept negative nominal interest rates if money can be put in a safe at zero percent interest. It is reasonable to assume that if there is a holding fee on money, people will be more willing to accept negative nominal interest rates. For centuries usury laws have been enacted to protect the poor from unscrupulous lending practises by setting a maximum level of interest. Economists contend that usury laws in the past failed because the interest ceiling was set below the equilibrium market interest rate. The effect of the interest rate ceiling may have been that only wealthy people could borrow money and that the poor had to manage themselves . Insofar the poor could not borrow at all they may have been better off in the end, but many poor may have become victims of loan sharks. It is often assumed that there is a risk free interest rate , for example on government bonds. Governments may not default outright but they can print money to pay off their debts, lowering the value of money. Another issue is that many economists assume that interest rates must be positive. There is a preference for having money now as money represents undifferentiated spending power. If you have the choice between 20,000 loafs of bread now or one loaf of bread each day for the next 20,000 days, you are likely to prefer one loaf of bread every day for the next 20,000 days. Most people will even prefer one loaf of bread each day for the next 1,000 days above 20,000 loafs of bread now, which implies a steep negative interest rate. Assumptions about interest in mainstream economics may turn out to be fatal. Risk free interest is an illusion. Interest increases risk as compound interest is unsustainable. Money does not depreciate in nominal terms so people tend to prefer money in the present above the same amount of money in the future. If money depreciates over time like capital, for example by a demurrage, people prefer to have money at the time they need it in the same way they desire a loaf of bread when they need it. Interest causes economically thinking humans to deplete natural resources now and not to care for the future. The rationale of interest is that you can use up everything now, make lots of money in the process, and put this money on the bank at interest, and have even more in the future. A ban on charging interest on money poses constraints on the funds available for borrowing. If the risk/reward ratio of capital is more favourable, interest rates cannot adjust upwards and direct investments will be preferred. As a consequence lending and borrowing is restrained and money substitutes (M2) will increase less relative to economic growth. As there will be less borrowing for consumption, the economy will not overheat due to unsustainable accelerated consumption. The value of money will increase as economic output increases and in this way the interest on money will reflect the return on capital. Consequently it will be possible to sustain borrowing and lending at zero percent interest. Borrowers with a high risk profile cannot borrow at zero percent interest. They may be better off because they have to postpone consumption instead of paying usurious interest rates. They will end up having more purchasing power in the end. It is however likely that schemes will be devised to chisel on any usury ban. Loan sharks may try to fill in the gap and black markets may emerge. Making charging interest on money illegal and nullifying loans with interest may help to alleviate this issue as it makes the risk of doing business for loan sharks prohibitively high, making black market interest rates prohibitively high for most prospective borrowers. Economic problems are often seen in terms of anaemic economic growth, unemployment, overinvestment, inflation, tight labour markets, lack of competitiveness, lack of demand or lack of supply. The common denominator of all those problems is that there is a mismatch between supply and demand. If all markets were perfect and supply could adapt to demand instantly, then there would be no economic problems. Those mismatches can exist in the real economy as well as in the financial sector. Often economic problems manifest themselves in cycles because mismatches occur from time to time and are resolved after some time. This process produces fluctuations in demand, supply, prices, stocks and employment figures. There are a number of theories and explanations regarding those mismatches, economic cycles and their effects. All those theories have merits and limitations. Insofar cycles are caused by monetary issues such as banking and interest, Natural Money may ease them. Future demand is not always easy to predict and the current price is often used as a signal guiding future production. If demand for a specific good increases then the price increases. If profits are high this will attract additional investments in production facilities. If profits are low or when there are losses, existing production facilities may be closed down or retooled for other products. Similarly, labourers need to acquire new skills and adapt to demand changes. Vacancies and higher wages can attract labourers to enter certain professions. Low wages and unemployment can deter labourers to enter certain professions. Even when demand is fairly stable supply can fluctuate, creating strong swings in price. This may happen if producers can enter and exit the market easily. An example is the pork cycle. When prices were low, pork producers cut down on production. After some time a shortage of pork emerged and prices rose significantly. At that time, pork production was increased so some time later a surplus emerged and prices dropped. This cycle was repeated over and over again. When a new technology or resource becomes available it may be profitable to invest in the new technology or resource, and this will result in new investments. The overall cost of living drops when the improvements start to affect market prices or new products will become available, and this will create additional demand. Investment, spending and economic growth will increase. A new technology often produces a wave of investments. If current profits are high then there is a tendency to over invest, as the current price often acts a signal for future production. For example, faster computers can create a competitive advantage so investing in them can be profitable. Because of investments in computer technology, products can become cheaper or new products can become available. This can create additional demand. It is likely that developments in information technology have contributed to economic growth in recent decades. There was also over investment in information technology. An example is the Internet startup boom around the year 2000. When the boom suddenly ended, a recession started. According to Say's law supply creates its own demand because goods and services are produced to acquire an equal value of other goods and services. This applies to a barter economy. If money is used as a medium of exchange, people can hold on to money and postpone their purchases. In this way producers can be left with overproduction, and a reduction in economic activity would be the result. Money hoarding can reinforce itself as a decline in economic activity can make people more cautious. They may start to save more and economic activity may decline even more. As a consequence, more people may expect that times get worse and start to save more. This cycle can reinforce itself and become destructive. Expectations are important in economics. If people feel secure and have a good feeling about their future, they are more willing to spend. A positive or negative feeling about the economy can become a self fulfilling prophecy. For example, if people expect a bank to collapse then this will happen because there will be a bank run. Therefore many policy makers tend to give a rosy picture of the economy or the state of the banking system. Price adjustments take time. If the costs of a business change, it may take time for those changes to manifest themselves in prices charged. Businesses have fixed costs and are reluctant to adjust prices downwards. Similarly, employees are reluctant to accept lower wages as they also have fixed costs and are accustomed to a specific standard of living. On the other hand, employers may be reluctant to raise wages to attract new employees when there is a shortage of labour. They may accept vacant positions in order not to have to raise wages of existing employees. A market price often lags the supply and demand picture. Related to the stickiness of prices is money illusion. Money illusion is the mistaken belief that an increase or decrease in price in money units represents an increase or decrease in real price. If the general price level increases or decreases then the value of the money unit changes. It takes time for people to realise that the change in prices is not real. Likewise, when a steady decrease or increase in prices suddenly stops, it takes time for people to realise that this has happened. Stickiness of prices and money illusion cause disequilibriums that will be corrected over time and this contributes to economic cycles. A price shock has the opposite effect of technological change. If an essential resource becomes more expensive, people have less money to spend on other items. Businesses will need to reduce investments to cope with the reduction in consumer spending, so spending, investment and economic growth will decrease. An example is the 1973-1975 recession that was partially caused by an increase in oil prices. During good economic times, businesses and individuals are confident and credit is readily available, so they tend to increase their leverage. Future income projections of businesses and individuals are often the basis for banks to lend money. When the economy slows down and their income reduces, they can get into trouble. People would have more disposable income when they were out of debt and did not have to pay interest. Similarly, businesses can go bankrupt even when they are profitable overall because of interest charges. For example, a business expects a return on investment of 8% and it can borrow at 6%. It makes sense use leverage and the business may have a financial capital of two thirds of total capital. If the return on capital turns out to be 3%, the business operates at a loss because of interest payments. If there was no leverage then the business would still operate at a profit. Leverage can add to economic instability as it fuels the boom as well as the bust. Often businesses are not liquidated but taken over at a lower price. In that case competitors that are more conservatively financed suffer as the overinvestment has created a new competitor with a lower cost base. Some of those more conservatively financed competitors can go bankrupt as a consequence. Leverage can be an accelerator of economic change as it destroys the capital of the leveraged business as well as the capital of the more conservatively financed businesses. Leverage also contributes to the overall risk in financial markets. Liquid financial markets make it more easy to enter and exit positions, making it appear that it is safer to operate with leverage. If markets are not liquid then leverage appears more dangerous as it is more difficult to exit a position. Liquidity of markets makes it possible to take more risk so the overall level of risk in the financial system may increase as a consequence of liquidity as liquidity may stimulate leverage. Banks create money by issuing bank credit that can be redeemed for money. From time to time a bank cannot meet the demand for money of its depositors and then the bank goes bankrupt. Because banks hold deposits at other banks, one bank's financial troubles can cascade through the banking system. People can lose their confidence in the banking system and bank runs may ensue. Banks may stop lending money because they want to meet the demand from depositors for money. This can cause a depression because a reduction in lending causes a reduction in spending and investments. During a depression business incomes drop in money terms so many businesses and people experience difficulty to repay their debts. This causes more businesses to go bankrupt and more people to become unemployed. More loans will then not be repaid and consequently more banks get into trouble. In this way a credit cycle can reinforce itself. Technological developments often make older technologies obsolete and previous investments in those technologies worthless. In many cases those changes are accompanied by changes in the demanded quality and quantity of labour. Also the business cycle destroys existing capital in a similar way by creating businesses during a boom and destroying them during a slump. Some Marxist theories state that existing wealth must be destroyed by war or economic crises in order to clear the ground for the creation of new wealth . Related to the Marxist theories is the theory of creative destruction. It states that innovative entry by entrepreneurs is a disruptive force that sustains economic growth, even as it destroys the value of established companies and the skills of labourers that dominate the market because of previous technological, organisational, regulatory, and economic developments . Ancient societies observed the adverse consequences of interest. Interest contributed to the concentration of money in the hands of a few people, while on the other hand many people were in debt or had become serfs of the money lenders. For that reason debts were forgiven from time to time . The Bible has provisions to forgive debts such as the Jubilee Year. Many ancient societies operated largely along the principles of gift giving to form productive reciprocal obligations and debt . Others used a commodity for money . The first manufacture of coins seems to have taken place around between 700 and 500 BC . Regardless of the type of money used, compound interest is infinite in the long run. This is only a problem when the money lenders do not spend the interest on their money but accumulate it. When money becomes concentrated into the hands of a few, less money remains in circulation and prices drop. It becomes difficult to repay debts with interest because the debts and interest are fixed in money terms. Interest payments further reduce the available money in the hands of the public. Money lenders can then take possession of the belongings of the borrowers and demand their labour as repayment. In this way many people became serfs of the money lenders. This phenomenon is called debt slavery. Much of the study of economics involves the implications of government policies on the economy. Macro economic policies are the manipulation of taxes, expenses and money supply to achieve goals concerning economic activity, employment and price levels. Stated policy goals are often high economic activity, low unemployment and stable prices. - Structural economic problems are often supply related, for example poor infrastructure or inadequate skills of labourers. - Cyclical economic problems are often demand related, for example falling incomes and a low consumer confidence. - Fiscal policies are policies that involve the manipulation of taxes and expenses to achieve economic policy objectives. - Monetary policies are policies that involve the manipulation of money supply and interest rates to achieve economic policy objectives. - Regulation can also be used to influence economic growth. It is often assumed that less regulation reduces business costs and improves economic growth. - Markets can deal with the issue (classical economics). - The economy is often not operating at full capacity. The government can influence economic growth with spending and taxes (Keynesian economics). - The central bank can influence economic growth with changes in money supply and interest rates (monetarism). - People are not stupid and anticipate the effects of policy actions (rational expectations). - Economic growth can best be achieved by lower taxes and less regulation (supply side economics). - Fractional reserve banking causes economic booms and busts. Policy interventions aggravate those problems (Austrian School). - Interest causes problems and international finance dominates communities and nations (community currencies, National Socialism). - An unbalanced distribution of wealth can cause a revolution (socialism, Marxism). - Economic growth is not sustainable (steady state economics, de-growth). According to classical economists, the economy tends to be in equilibrium at full employment because the desires of consumers exceed the capacity of the businesses to satisfy them. People produce in order to consume what they have produced or have acquired by exchanging what they have produced for what others have produced. This is reflected in Say's Law, which states that supply creates its own demand. When the economy is not in equilibrium at full employment, this is caused by a lack of price flexibility. Classical economics suggests that everything will work out fine when markets are competitive and flexible so that prices can adapt fairly quickly. According to classical economics it is better that governments do not interfere with the economy, except for making markets more flexible and competitive. Unemployment is a consequence of inflexibility of the labour market. If markets have price flexibility then problems will resolve themselves quickly and recessions will be short lived. Classical economics assumes that if there is a surplus of goods or services, they will drop in price until they are consumed (see figure 1). Lower prices will make it more attractive to buy those goods and services while it be less attractive to produce them. Consumption will rise and production will drop and a new equilibrium will be achieved. If the demand for goods and services drops from D1 to D2, there will be a surplus at price level P1 and only Q2 products will be consumed. As long as prices have not dropped to P2, there will be a surplus of products. After some time there will be a new equilibrium at a price level of P2 and and a quantity of Q3. This may create a surplus of labour. Classical economics assumes that if there is a surplus of labour, it will drop in price until there is full employment (see figure 2). At lower wages, working is less attractive so there will be less people willing to work. At lower wages, it will be more attractive to hire people so employment will rise at lower wages. If the demand for labour drops from D1 to D2, the number of people employed drops from N1 to N2 if the real wage level remains W1. As long as the real wage level has not dropped to W2, there will be some unemployment. After some time a new equilibrium has arrived at a real wage of W2 and a number of people employed of N3. When prices drop the value of money rises. This means that the money stock increases in the equation Money Stock (M) * Velocity (V) = Price (P) * Quantity (Q). According to classical economics, people will feel richer as a consequence and start to spend more and save less. Even if they do not spend more in money terms and velocity does not change, they spend more in real terms. Demand will rise again as will employment. National income is consumption plus investment, which is reflected in the equation National Income (Y) = Consumption (C) + Investment (I). If consumption drops, there is more money in the form of savings available for investment. At the same time businesses need to reduce production so the investment demand for money will also drop (see figure 3). According to classical economists people save money in order to have more in the future. Because people have a time preference and prefer present consumption above future consumption, they only postpone consumption if interest rates are high enough. A lower real interest rate makes saving less attractive while more projects become feasible, which produces a higher investment demand for money. 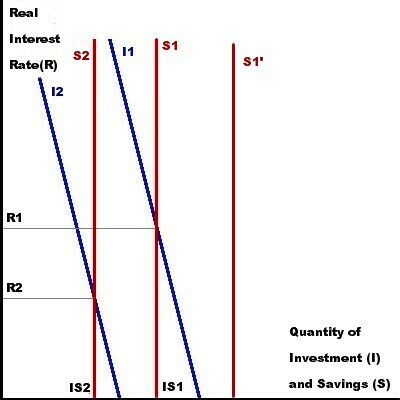 If the supply of savings increases from S1 to S2 (a lower line means more supply at a given price) then the interest rate will drop from R1 to R2 while the quantity of investments and savings will increase from IS1 to IS2. 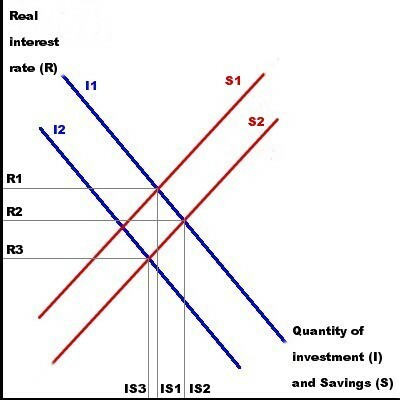 If investment demand then drops from I1 to I2, then the interest rate will drop further from R2 to R3 while the quantity of investments and savings will decrease from IS2 to IS3. There are some issues with the assumptions of classical economics. Businesses may continue production as long as the price exceeds the variable costs of making the product so overproduction may persist for a longer period of time. If prices drop, people may not start to spend more. They may wait until prices drop further. Because employment and incomes are dropping, people may become more cautious. This can cause a deflationary spiral. If labour drops in price, its supply may increase rather than decrease because people may try to make up for the income lost. This could create a race to the bottom in wages. To deal with this issue, labour unions have tried to corner the market for labour and governments have introduced minimum wages. Because there are labour unions and minimum wage laws, the market for labour is not efficient, making it difficult to adjust prices downward when there is lack of demand for labour. Most people save for a specific purpose, for example retirement. Those savings depend little on interest rates. Savings may even reduce when real interest rates are high as the perceived objectives can be achieved with less effort. Lower real interest rates may therefore increase savings. If people are cautious because they are unsure about their future, they may start to save more regardless of interest rates. Banks can create money and not all loans are made out of savings so investments (I) do not equal savings (S) and the market interest rate is not the natural interest rate. The market interest is lower than the natural interest rate when the economy is booming. As a consequence bad investments are made during the economic boom. Interest rates cannot go negative even when the market equilibrium for savings and investments is at a negative interest rate. People prefer to keep savings in cash below a certain rate of interest. During an economic crisis savers may demand higher interest rates to compensate for the risk of default while lower interest rates may be needed to sustain the economy and reduce the risk of default. Keynesians see low demand combined with excess savings as the primary cause of economic depressions, often called general glut. The circular flow of money (figure 4) is an important element in Keynesianism as is the equation National Income (Y) = Consumption (C) + Investment (I). If consumption (C) reduces then investment (I) must rise. If demand is lower than anticipated, excess investments are made in unsold inventory. As a consequence production will be lowered as will subsequent investments. This may cause a downward spiral that ends at a lower equilibrium national income with a considerable level of unemployment. The following example may illustrate this. Suppose that there is equilibrium at a national income (Y) of 100 where consumption (C) is 90 and investment (I) is 10, which is equal to planned investment (Ip). Then consumption (C) drops to 80 and investment (I) rises to 20, of which 10 is planned (Ip) and 10 is an unplanned increase in inventory (Iu). Suppose that production will be scaled down by 15 to 75 to anticipate lower demand and to reduce inventory. Unemployment will then rise and consumption (C) drops to 75. Businesses do not see a reduction in inventory and scale down production 10 more to 65. Employment reduces again and consumption (C) drops to 70. The next time consumption remains 70 but production remains 65 to sell inventory. Suppose that businesses then reduce planned investments (Ip) to 5 because there is less demand then national income (Y) may stabilise at 75 with a consumption (C) of 70 and planned investments (Ip) of 5. An interesting observation can be drawn from this calculation. Because people wanted to save more, they end up saving less because incomes dropped. Households intended to save 20 but ended up saving only 5 at the new equilibrium. This phenomenon is called the Paradox of Thrift . The Paradox of Thrift depends on prices being sticky. If all prices including interest rates could adapt immediately to market conditions then this would not happen. Keynesians assume that prices are sticky. Most notably wages and interest rates do not adjust quickly downwards. Because of money illusion employees will resist lower wages even when prices are lower. Interest rates will not fall as much as is required to make savings (S) match investments (I). According to Keynes, people will hold on to cash and not lend out money, hoping to fetch better interest rates in the future. There is not much downward risk when interest rates are low. 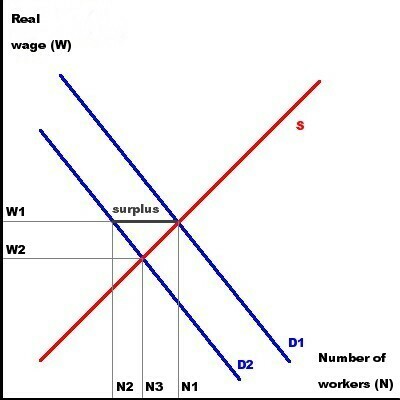 According to Keynesian analysis cutting wages is a bad idea as it will reduce aggregate demand further while insufficient aggregate demand is the cause of recessions in the first place. Furthermore, if wages and prices were falling, people would start to expect them to fall. This could make the economy spiral downwards as those who have money would postpone spending as falling prices makes their money more valuable. Price deflation can make a depression deeper as falling prices and wages made pre-existing nominal debts more valuable in real terms. Keynes thought that planned savings (S) do not depend on interest rates and that planned investments (I) depend on long term profit estimates that are somewhat influenced by interest rates. Lower interest rates make more projects feasible (see figure 5). Assume that there is equilibrium when planned savings and investment are IS1 and the interest rate is R1. If planned savings increase significantly to S1' then equilibrium could only be achieved at a negative interest rate. This does not happen so the economy will contract until a new equilibrium is reached at planned savings and investment of IS2 and an interest rate of R2. Prices and wages can adapt downwards but interest rates cannot go below zero. Keynes thought that a liquidity trap can occur, which is a floor under which interest rates cannot fall. He suspected that in this trap any increase in money supply will cause bond holders to sell bonds to obtain liquidity. This may be because nominal interest rates cannot go below zero so there is little downward risk when interest rates are low. The liquidity trap is also known as the Zero Lower Bound Problem . The interest rate on money can not follow any negative interest rate on capital during an economic downturn. According to Keynesian economics, there is a trade off between employment and inflation. The Phillips curve reflects an assumed inverse relationship between the rate of unemployment and the rate of inflation. Increased aggregate demand is inflationary but it also reduces unemployment as it will lower real wages. This effect may only exist in the short run . If employees and businesses have little pricing power because of unemployment and unused capacity, increased aggregate demand may not produce price inflation. The overall effect of increased aggregate demand is still inflationary as it will prevent price deflation. When a government increases spending or lowers taxes, the effect on the national income (Y) is in most cases greater than the amount of the spending increase or the amount taxes are lowered. The following example may illustrate this. Suppose that there is equilibrium at a national income (Y) of 80 where consumption (C) is 70, investment (I) is 5 and government spending is 5. If the government starts to spend an additional 10, then national income (Y) initially increases with 10. Consumers may spend 5 of their additional income, while investments (I) rise with 2 and taxes (T) with 3. National income (Y) rises with government spending (G) + consumption (C) + investment (I) = 10 + 5 + 2 = 17. Of the additional 7 national income (Y) generated by increased consumption (C) and investments (I), 4 may be spent on consumption (C), 1 on investment (I) and 2 on taxes (T), making the total increase in national income 22 if the additional tax income is not spent. The additional consumption and investment may lead to more consumption and investments and may finally lead to an increase in national income of 25, and an increase in tax income (T) of 7. In this case, an increase of government spending (G) of 10 increases national income (Y) with 25. A change of government spending (G) has a multiplying effect on national income (Y). The 25 increase in national income (Y) generated by the 10 increase in government spending (G) may be spread over more than one year. The increase in national income (Y) is 2.5 times the increase in government spending (G). This is called the multiplier effect, which is expressed in the multiplier equation Multiplier (m) = ( Final Change In National Income (ΔY) / Initial Increase In Government Spending (ΔG) ). In this case the multiplier is 2.5. An increase in government debt of 3 produced an increase of national income of 25. In reality the effect of increased government spending is more limited. Keynesian thinking has led to an increase in government debts on which interest must be paid. Compound interest can over time reduce the effects of Keynesian economics, unless the economy grows at a higher rate or the value of money depreciates. In most cases, it is a combination of economic growth and inflation that have held government debts sustainable. Government actions often make markets less efficient. Fiscal policies such as government spending tend to favour politically connected businesses. There is also a time lag between the occurrence of the problem and the effects of increased spending taking hold. At that time the recession may be over and the increased government spending can help to overheat the economy. Keynesian thinking undermines fiscal discipline and government deficits have become the norm. When the economy is overheating, Keynesian economics prescribes that governments decrease spending or increase taxes, but this rarely happens. Government spending tends to increase year over year and government deficits have become a problematic issue in many countries. Related to the previous problem is that politicians who raise taxes or reduce spending have a higher risk of not being re-elected. Some economists assume that there is a political business cycle. Incumbent politicians may use macro economic policy instruments to improve their chances on re-election by stimulating the economy just prior to an election. Keynes saw stickiness of prices as a problem, but by increasing aggregate demand prices are less likely to correct. Keynesian policy actions therefore add to the stickiness of prices, which was an important reason to implement those policy actions in the first place. Only interest rates are truly sticky because they cannot go below zero. Keynesian policies, in the way they are implemented now, do not allow the overall price level to correct downwards, so they are inflationary overall. The basic tenet of monetarism is that a change in the money stock will, in the long run and all other things being equal, lead to a proportional increase in price level . Among others, monetarists assume that the velocity of money is relatively stable in the long run. In the Keynesian view, there is a tradeoff between employment and inflation as is reflected in the Phillips Curve that suggests that more inflation goes together with less unemployment. Monetarists think this effect only exists in the short run and solely because workers and businesses confuse a change in price level with a change in real prices and wages . When business owners see their costs rise and their profits drop and workers see their costs of living rise and demand higher wages, unemployment rises again, so there is no tradeoff between employment and inflation in the long term . Monetarists like Milton Friedman opposed the gold standard because there would be no practical way to counteract deflation and reduced liquidity and any attendant recession . Instead they proposed a fixed monetary rule, where the money supply would be calculated by known macro economic and financial factors, targeting a specific level or range of inflation . Monetary inflation may be desired to offset the effects of compound interest. The rational expectations theory is based on the efficient market hypothesis, which states that markets reflect all available information. The theory assumes that new information is absorbed rapidly by a large number of rational participants and that no participant has significant market power. Similarly, the rational expectations theory assumes that market participants base their expectations of the future, including future policy actions on past, present and projected future information . Government guarantees and support tend to increase moral hazard as market participants expect that the government will help them out. A possible effect of rational expectations is that it can make government policies ineffective. According to the rational expectations theory, Keynesian theories do not account fully for the changes in people's expectations about the consequences of fiscal and monetary policies . People learn from experience. The consequences of the expansionary monetary policies that started in the 1960's became entrenched in the expectations of people during the 1970's, rendering Keynesian policies ineffective and causing stagflation as people started to anticipate inflation in their decisions. Another example of how rational expectations work out in practise is the Greenspan Put. When during the tenure of Alan Greenspan a crisis arose and the stock market fell significantly, the Fed lowered the Federal Funds rate and added monetary liquidity to encourage risk taking in the financial markets. This was done to avert further deterioration like in the aftermath of the 1929 stock market crash . The actions of the FED reduced the risks of investing in financial markets but they also increased moral hazard as market participants started to count on FED support in times of crisis. Supply-side economics argues that economic growth can be improved by lowering barriers for people to produce goods and services, such as lowering income tax and capital gains tax rates, and by allowing greater flexibility by reducing regulation. According to supply-side economics, consumers will then benefit from a greater supply of goods and services at lower prices. 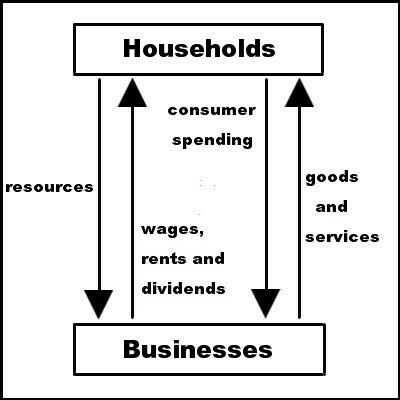 Supply-side economics proposes that production or supply is the key to economic prosperity and that consumption or demand is a secondary consequence. This idea is similar to Say's Law . Supply-siders feel that in a high tax rate environment, lowering tax rates can raise revenue by causing more economic growth. Supply-side economics holds that increased taxation reduces trade between economic participants within a nation and that it discourages investment. Taxes act as a type of trade barrier or tariff that causes economic participants to revert to less efficient means of satisfying their needs, such as doing a job yourself instead of hiring a professional . It is likely that lower taxes on labour will increase employment. For example, you can hire a contractor for a construction job or do the job yourself. Assume that the contractor can do the job twice as efficient as you can but he charges € 40 per hour including taxes. If your net income after taxes is € 15 per hour then it is cheaper to do the job yourself. In countries with high taxes on labour it is often worthwhile to take a leave and do a job yourself, even when a professional works more efficiently, simply because of the tax burden. Supply-side economics does not advise to improve the quality of education and infrastructure, which are both methods to enhance economic growth by improving supply. If the right investments in education and infrastructure are made, this may greatly improve economic output. A government may not be efficient in estimating future business requirements or may be captured by vested interests, so those policies may not always have the desired results. Many large infrastructure projects that have cost billions of euros have had little impact on the supply side. They may have provided an economic stimulus however. The Austrian School bases its analysis on the purposeful actions of individuals. Austrians seek to understand the economy by examining the consequences of individual choices. This approach differs significantly from many other schools of economic thought, which have placed less importance on individual actions and focused instead on aggregate variables, equilibrium analysis, and the consideration of societal groups rather than individuals . The Mises of the Austrian School of Economics branch contends that many economic problems are caused by government actions, which are seen as acts of coercion . The Mises branch is favoured by libertarians who reject government action to various degrees, most notably in economic issues. A government is a form of monopoly that has a tendency to expand its operations beyond providing an optimal service to its citizens. Governments may become oppressive as government implies authority. The state tends to attract parasites that live off taxpayer money. Some libertarians oppose political freedom because people can collectively decide to restrict economic freedoms, for example the freedom to pollute water in order to make money. Others fear that unproductive people may elect officials that will take money away from hard working people in order to give it to them. The Austrian business cycle theory views business cycles as the consequence of excessive growth in bank credit, exacerbated by central bank policies which cause interest rates to remain too low for too long, resulting in excessive credit creation, speculative economic bubbles and lowered savings . According to the theory, the boom-bust cycle is generated by credit expansion that is not backed by savings. Fractional reserve banking makes more funds available for lending. This lowers the interest rate and facilitates a boom. Austrians argue that the monetary boom ends when no further investments can be found which provide adequate returns for speculative borrowers at prevailing interest rates and bank credit expansion stops. They further argue that the longer the artificial monetary boom goes on, the bigger and more speculative the borrowing, and the more wasteful the errors committed, the longer and more severe will be the necessary readjustment consisting of bankruptcies, foreclosures, and depression . The influence of bank credit on the boom-bust cycle is not primarily caused by fractional reserve banking but by positive nominal interest rates. The Austrian School of Economics rejects many of the findings of mainstream economics. Mainstream economists contend that Austrian School views are often not supported by empirical evidence . Most economists think that financial innovations such as fractional reserve banking improve the efficiency of financial markets. Fractional reserve banking is inflationary as it implies that real money (M1) in current accounts can be used for lending, which expands the amount of real money (M1). If only money in savings accounts can be used for lending, only the amount of money substitutes (M2) would grow, and the effect would be less inflationary as money substitutes (M2) are less liquid than real money (M1). Banks have a maturity transformation function because savings and loans tend to have different maturities. On average savings with a shorter maturity are transformed into loans with a longer maturity, which is inflationary insofar savings are liquid. In theory it is possible move any positive balance on a current account to a savings account and supplement any negative balance on this current account with money from the same savings account. There is little difference between such an arrangement and fractional reserve banking. The real problem is that money in current accounts is subject to the same risks as savings so putting money in a savings account is not purposefully accepting the risks of banking and being rewarded for this. The boom-bust cycle would still exist when loans are made out of savings, simply because compound interest is infinite in the long run. During the boom phase there tends to be excessive optimism and high interest rates seem to be justified by future incomes, but those high interest rates also precipitate a bust. Lowering interest rates tends to extend the boom phase and possibly makes the bust worse. This is an important insight from the Austrian business cycle theory. The Austrian School also stresses the importance of purposeful action by individuals. Putting money in a savings account should imply accepting the risks of banking in order to receive a higher return, otherwise moral hazard may pervade the financial system. Many proponents of the Austrian School of Economics favour a gold standard. The value of gold depends on its rarity, attraction and monetary qualities. Its value does not depend on the trustworthiness of an issuer. Over the ages gold has retained its value while other currencies did not. The problem with using gold as money is that it makes interest on money inevitable as gold does not depreciate. Gold is an excellent store of value and it is prudent to have a certain amount of gold and silver in case the currency systems fails. Gold will always be a substitute for money. A possible introduction of Natural Money currencies will not change that. The community currencies movement and National Socialism have remarkably similar views on the economy. The community currencies movement seeks to reassert local control over economic life and money using local interest free currencies. The movement alleges that the requirements of international markets, and most notably interest, cause economic suffering. National Socialism tries to do the same on the national level and also sees interest and international finance as the main culprits of economic suffering. Trade between nations is based on mutual exchange, otherwise capital controls may be needed to balance international trade. International finance undoubtedly benefits from free trade. During the nineteenth century Great Britain had become the most prominent proponent of free trade . At that time other countries like the United States and Germany had protective trade barriers that enabled their own industries to develop. Lawmakers in Great Britain were reluctant restrict free trade because this would harm the interests of the City of London . Similarly, Wall Street benefits from free trade, while it may harm manufacturing at the same time. The economies of scale and unrestrained international trade have downsides, such as the depopulation of the countryside, mom and pop stores being replaced by larger retail chains and Internet stores. By introducing closed circuits of money circulating on the local or regional level, the community currencies movement seeks to reduce the pressure of competition in order to help a middle class of smaller local and regional labourers and entrepreneurs. Both ideologies try to curb the freedom of movement of capital and want to break free from the international financial system that is considered to be parasitic in order to make the community or nation more self-determined. The community currencies are backed by labour and often have a holding fee that provides a stimulus. The government of Germany in the 1930's issued a currency backed by labour and spent it on rearmament and public works to provide a stimulus. In the Austrian town of Wörgl a community currency enjoyed a considerable success. This approach can have merits during an economic crisis. It needs capital controls or an exchange fee to discourage external trades. The Wörgl success was inflated by deferred tax payments. People that were unable to pay their taxes previously were able to pay them in the community currency, giving the town council money to provide an additional stimulus. This effect would be reduced after all taxes due had been paid off. The economic success of Germany in the 1930's was mostly caused by spending on rearmament. If all the money had been spend on public works instead, it may have resulted in the construction of useless roads and buildings. According to Marxist analysis there is a class conflict within capitalism between labourers and wealthy businesspeople. Marxists contend that modern highly-productive production methods and private ownership leads to private appropriation of the surplus value of labour (profit) by a small minority of private business owners. It will lead to social unrest between the two classes, culminating in a social revolution. The outcome of this revolution would be the establishment of socialism, which is based on cooperative ownership of the means of production . Socialism and Marxism emerged during the nineteenth century when there was widespread poverty caused by an over supply of labour. Karl Marx lived in England where the Industrial Revolution had progressed further than anywhere else. For every worker who had a job, many others were in need of a job, so wages were low and working conditions were poor. On the other hand a few factory owners were extremely wealthy. Under those conditions ideas about class struggle could emerge. The underlying issue was that the risk of doing business was extremely high and competition, for example in the cotton textile industry, was intense. The number of bankruptcies was high so many factory owners felt the need to press their workers . An unequal distribution of wealth can lead to discontent and revolution. Socialists argue that free markets without government intervention will lead to an unequal distribution of wealth, while proponents of free markets contend that government intervention creates profit opportunities for politically connected business owners. Poverty and the unequal distribution of wealth have multiple causes, for instance culture and education. Profits tend to reflect the risk of doing business and it seems that reducing the risk of doing business will increase the overall level of wealth as well as wealth equality. Excess profits tend to lead to more competition and a higher demand for labour, which lowers the price of products or increases the price of labour. As profits tend to reflect the cost of doing business, the reward for labour could rise when the risk of doing business is lower. Interest on money causes business cycles and economic crises, so a monetary system without interest may increase the reward for labour. Insofar an unequal distribution of wealth reflects the differences in contributions to society this may be desirable, because it may be beneficial overall. In certain situations acquired wealth does not reflect a contribution to society, for example with inheritance and financial innovation. People inheriting a large estate did not do so because of their economic value. Most financial innovations probably were mostly beneficial to a small group of informed people. They were often schemes to dupe less informed people or to exploit the consequences of interest on money such as financial instability. The degrowth movement is based on ecological economics and anti-consumerist and anti-capitalist ideas. It advocates for the downscaling of production and consumption, arguing that overconsumption lies at the root of long term environmental issues and social inequalities . The development of steady state economics is a response to the observation that economic growth has limits, given its consequences such as climate disruption, widespread habitat loss and species extinction, consumption of natural resources, pollution, urban congestion and an intensifying competition for remaining resources . The main driver of unsustainable economic growth is interest on money. The hidden consequence of interest is that people tend to prefer being rich now to surviving the future. This is similar to preferring 20,000 loafs of bread today above one loaf of bread every day the next 20,000 days. A negative nominal interest rate will discount future income at a higher price while a positive nominal interest rate will discount future income at a lower price. As exponential growth cannot be sustained, negative real interest rates on money may be needed in the future. This is feasible with a demurrage on the currency. The views of the different economic schools have all merits but solid evidence supporting their views is hard to come by. In a real world economy different issues are at play at the same time. For example, economist Paul Krugman criticised predictions of high inflation made by Austrians in 2011 by stating that the monetary base had tripled without causing a rise in inflation rates . Other factors may have been at work, such as price competition from low wage countries, credit contraction and questionable inflation statistics. In the long run an increase in the monetary base must be inflationary . In economics political agendas may be hidden in the assumptions. Keynesians and monetarists have a vested interest in interventions by governments and central banks. Keynesian economics and monetarism have enjoyed a considerable success because they both propose measures to counteract the effects of compound interest. Those methods have worked in the past. That is the reason why deficit spending and monetary expansion are still very popular with policy makers. The moral hazard and the inefficient allocation of capital that result from anticipated interventions by governments and central banks seem a lesser evil compared to economic depressions. As a consequence many countries have become dependent on easy credit. At some point their currencies may fall out of grace and their economies may be crushed by significantly higher interest rates. During a crisis Marxist analysis may suddenly attract attention when an impoverished proletariat emerges. Libertarians may argue that the government interventions are to blame, and that if markets had been left alone, the nation would have been more prosperous. Both interest on money and the moral hazard attached to government interventions and credit not backed by intended savings can be blamed for a breakdown of the financial system and the perceived need for bail outs. Unless interest on money and credit are restricted, new financial crises will probably emerge because compound interest is unsustainable in the long run. Furthermore, when a loan is not backed by someone willing to take the risk of default at the negotiated price, risks in the financial system may escalate and regulation may always lag financial innovations. The adverse social consequences of international trade and finance are difficult to gauge. Many economists think that reducing trade barriers and a free flow of capital will be beneficial overall because of the law of the comparative advantages. This may not always be the case as central banks can distort currency markets by building up currency reserves. It is also true that many countries like the Asian Tigers were able to build their economies by protecting their home market via trade restrictions. It seems that Natural Money is only feasible in mature societies with a sufficient level of education, political freedom and economic freedom. Political and economic freedom may sometimes be at odds, but a well educated population is aware of the trade offs that must be made when property rights and economic freedoms are restricted in order to achieve political goals. If a society is not mature, real interest rates above the level of economic growth may be needed to attract capital because of the risks attached to those societies. In that case introducing Natural Money may not work. The expansion of human activities is hitting the limits of the planet. It may not be possible to increase material wealth in the future. It may nevertheless be possible to preserve a reasonable standard of living if natural resources are used more wisely. Negative nominal interest rates may help in this respect as they attribute a higher value to future income relative to present income, so the economy can adapt to a lower level of material wealth more gracefully. On the other hand, economic growth with Natural Money may be higher as there will be fewer economic crises. Debt levels cannot grow out of control. The economy may grow at the maximum sustainable growth path. Governments may not need to intervene, making the economy more efficient. There may be less parasitic activities in finance at the expense of the real economy because moral hazard will be reduced. Decision making may be localised so bureaucracy can be reduced. The improved performance of the economy may attract capital at the expense of economies allowing positive nominal interest rates. As a consequence Natural Money may become the dominant type of money in the future. This is not a matter of desire or preference. Practically nobody wanted capitalism at first, but it emerged as the dominant economic system despite all the resistance, simply because it was more efficient and produced more wealth. The same may apply to Natural Money.